The achievements of Don, the scientist, are legion. 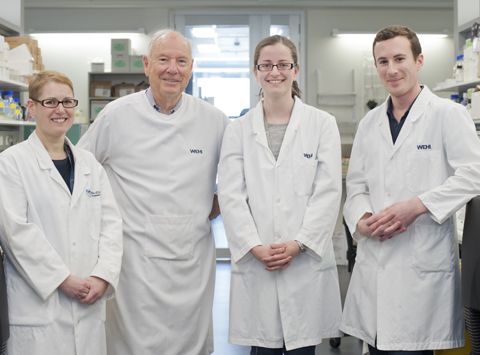 Don introduced cancer research to the Walter and Eliza Hall Institute at a time when its Director, the Nobel Prize winner Sir Frank MacFarlane Burnet, viewed cancer as an “inevitable disease”, with “anyone who wants to do cancer research, either a fool or a rogue”. Studying leukemia in 1964, Don and Ray Bradley, from The University Of Melbourne, discovered it was possible to grow bone marrow cells in plates of partly set agar jelly. Don’s genius lay not in this breakthrough, but in the realisation that it could be used to understand the cellular basis of blood cell production and to discover the hormones, which he named colony-stimulating factors, that regulate blood cell production in the body. Don worked single-mindedly on this theme for the next 50 years. He characterised blood stem cells and their daughters cells, which are committed to producing the multiple types of white blood cells that fight infection and prevent bleeding. In doing so he made the blood cell system the ‘poster child’ of medical research and shone a light into the darkness for those who followed him to work on understanding other tissues such as the breast, skin and colon. Don also understood his limitations. Although he was comfortable with cells, he was wary of molecules such as DNA and protein. Nevertheless, Don knew he needed collaborators who would take him out his comfort zone and help him fulfill his ambition of delivering health benefits from his discoveries and so he assembled a team of researchers who worked with him for 40 years. Don’s ability to identify a glimmer of talent in younger researchers and mold them into a cohesive, loyal and vibrant team that consistently came up with ground-breaking discoveries, was remarkable. Decades ahead of its time, his model of collaborative, multidisciplinary science shaped the culture of the Walter and Eliza Hall Institute and is now seen as almost mandatory if big problems are to be tackled and significant breakthroughs are to be made in medical science. After two decades of dogged progress, Don and his team succeeded in the Herculean task of isolating four of the blood CSFs, which were present in tiny quantities in the body. Despite Don’s profound fundamental discoveries, which shaped basic understanding of how blood cells are made and work, he always recognised and espoused the responsibility of medical research to help those suffering illness and disease. Isolation and cloning the CSFs paved the way for their mass-production and clinical testing. Don found that injection of the hormones into animals resulted in a rapid increase in the number of blood cells responsible for battling infection and he surmised that they might be used to help cancer patients overcome one of the major side effects of chemotherapy: a loss of white cells and susceptibility to life-threatening infection. Don’s hunch about clinical use was proven true – over the past 20 years, more than 20 million cancer patients, including Spanish tenor Jose Carreras, have been treated with CSFs and, as a result, have been given the best possible chance of beating their cancer. CSFs are now standard treatment and every year the number of people alive because of Don’s work grows. There can be no greater legacy for a medical researcher. Don was practical – he eschewed the modern trend of senior researchers to move permanently from the laboratory to oversee a large team from the safety of an office. He was a man of scientific action. Many a young researcher was left with ears ringing after a spray from Don that would make John Kennedy senior’s 1971 half-time grand final address to his Hawthorn players (“At least DO SOMETHING! DO! Don't think, don't hope, do!”)seem like polite encouragement. Don was hard working. He led from the front and expected his team to follow. From the day he entered medical research, until he was diagnosed with cancer four months ago, he would begin work early, between 7.00 am and 7.30 am either doing experiments or writing scientific papers solidly until 5.30 pm; his only compromise being a lunchtime or mid afternoon finish on Saturday. Upon a new recruit starting in his unit, it was mandatory for them to meet with Don who, at least until the mid 1990s, would be smoking a cigar, and would lull you with a question like “have you had a good holiday” - inviting a response like, “yes thank you Professor Metcalf, I have had a lovely two weeks camping at Wilson’s Promontory” - which was then followed by “excellent, that’s the last holiday you will have for three years, get to work”. And it was the last holiday you took, not because Don would stop you taking leave, but because his hard work was infectious and the lab would become your world. Don was loyal. He was loyal to the Walter and Eliza Hall Institute – working there almost continuously for 60 years from 1954 to 2014, despite lucrative offers from all over the world. Don enjoyed the tyranny of distance, which he believed made it easier for Australian scientists to pursue highly original research, away from the latest trends and fads. Don was steadfastly loyal to the four directors, under whom he worked and sometimes disagreed. His attitude approached a US-style respect for the office of the President. Although deeply suspicious and somewhat intolerant of people he called “prancers” or “strutters” once you had proven yourself to be practical, thoughtful, reliable, hardworking and collaborative, you were ‘in’. Being ‘in’ meant a draft of a scientific paper would come back from Don’s office with more red ink than black type. It meant you could be mercilessly interrogated about your science during a seminar or excoriated over some minor antisocial laboratory behavior. Being ‘in’ meant you would be defended to the hilt in front of visitors or other groups. You became part of the team. There was no greater honour. This was one of Don’s favorite passages, the other being Tennyson’s Charge of the Light Brigade. Don’s autobiography was entitled “Summon up the Blood: In dogged pursuit of the blood cell regulators” (AlphaMed Press, Dayton, Ohio, USA, 2000. ISBN 1-880854-28-7).